This property is 2 minutes walk from the beach. 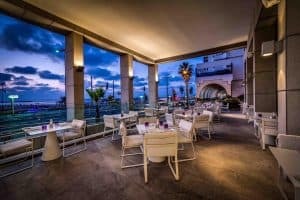 Royal Beach Hotel Tel Aviv by Isrotel Exclusive Collection is located on the Tayelet Boardwalk, between Hayarkon and Herbert Samuel Street. This modern and luxurious hotel offers an outdoor pool, an à-la-carte restaurant and bar, a Spa and Wellness Area, an Executive Lounge and a fitness centre. Wi-Fi is provided throughout. All rooms are luxuriously designed and fitted with top quality furniture. They all include a luxurious bathroom with free toiletries, a work area, an LCD TV with connection to Israeli and international channels, a minibar and seating area. The Hotel is home to the West Side Restaurant, a gourmet kosher restaurant, which serves both fish and meat dishes. A full Israeli breakfast buffet is served each morning, and includes pastries and bread, fish dishes, eggs and a selection of hot and cold beverages. The lobby bar offers kosher food and drinks. Room service is available 24 hours a day. Concierge service is also available. The Spa and Fitness Area offers saunas, massages and Turkish baths, while a fitness room is also available. Meeting and banquet facilities are available, as well as car rentals and a shuttle service. The hotel is set just 500 m from the Carmel Market and Nachalat Binyamin Street Market. The Main Bus and Train Station is 3 km away, while the Ben Gurion Airport can be reached in 16 km.